For more than 30 years Holohil Systems Ltd. has supported endangered species research and educational work for a variety of agencies and researchers. We wish to extend our support to other species that have not previously been included. To this end, we wish to extend our support to research projects that have of high value for their species, a sound research design, and a positive conservation intention. In addition to the equipment support, Holohil is providing winners with a forum to promote their inspiring and impressive project through this page on our website. Hawaiʻi is the endangered species capital of the world, yet conservation here is woefully underfunded. 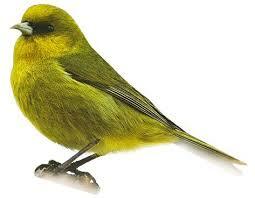 Over 71 forest bird species have become extinct across the islands. In Kauaʻi, just eight native forest bird species remain, including ʻAkekeʻe, a critically endangered passerine endemic to Kauaʻi. The current population numbers only 945 individuals, located in the remote high elevation Alakaʻi Plateau in the heart of Kaua’i. The biggest threat to ‘Akeke’e is introduced avian malaria. Global warming allows disease-carrying mosquitos to survive at higher elevations, the final refuge for forest birds. This threat cannot yet be addressed at a landscape level in Kauaʻi, given its low elevation; thus they are exposed most of the year to this disease. Translocation to the higher elevations of Maui or Hawaii islands (where mosquitos and malaria cannot exist) is therefore critical to protect the species. For a successful translocation, KFBRP needs to better understand ʻAkekeʻe ecology. The only way to do this is through radio-telemetry, as ‘Akeke’e are extremely difficult to locate, follow and observe in the high canopy of our sites, which have challenging terrain. Telemetry provides fine detail about biological requirements such as nesting and feeding sites, behavior, habitat use, landscape-level movements, and will allow us to assess food availability and possible diet overlap with Maui and Hawaii birds present at potential translocation sites. 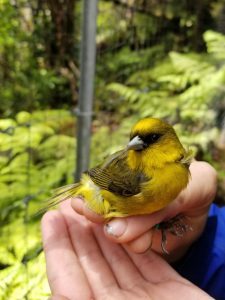 This project forms part of a larger telemetry study on Kauaʻi’s endangered forest bird species that uses eight telemetry towers with data loggers to track birds 24/7 across the Plateau’s many ridges and valleys that are impossible for humans to scale on foot as quickly as birds fly. In May and June 2019, we will target mistnet ‘Akeke’e using playback, because ‘Akeke’e are rare and difficult to capture. We will attach radiotransmitters to ~10 ‘Akeke’e and use telemetry data to document habitat use, movements, and dispersal. Telemetry data will be correlated with LiDAR and other habitat and environmental data, greatly increasing the knowledge needed to successfully plan a translocation to help save this imperiled species. Africa is home to over 80 species of small carnivores (<20 kg). Considering that most of them have not been studied thoroughly – or not studied at all – there is clearly a huge gap in our knowledge of African small carnivores in particular, and their roles in ecosystem functioning in general. Hence, the launching of the first scientific study on the ecology, behavior and conservation of Libyan Striped Weasel in Africa will certainly contribute toward filling a part of this gap, as well as enrich our general knowledge on African biodiversity. A PhD project started in April 2018 and the 1st study year consists in a country-wide assessment of the distribution, abundance and threats to this species in Tunisia, using questionnaire surveys, spot-lighting, live-trapping and field sign surveys. •	Will males have larger home ranges than females and will their home ranges overlap with those of neighboring females, as observed in other small carnivore species? •	Will male daily ranges be larger than those of females, and will movement distances be longer during the reproductive season? 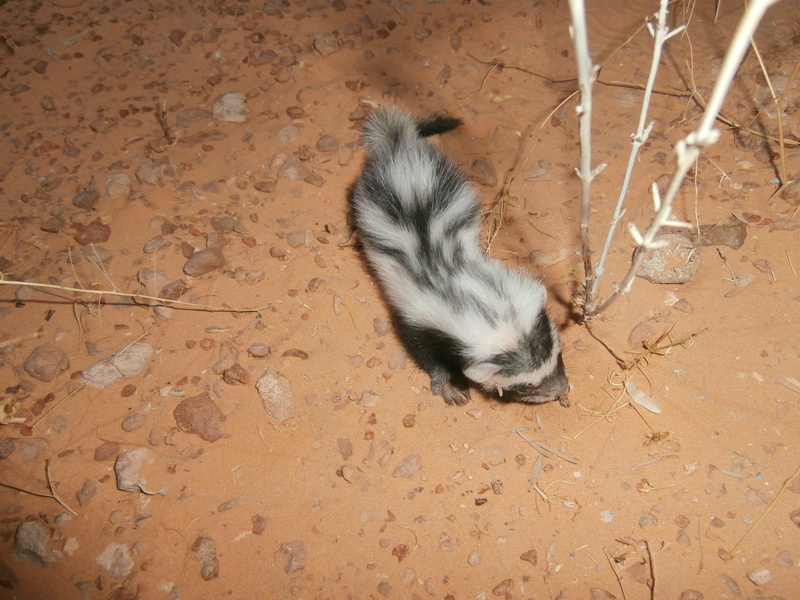 •	Is the Libyan Striped Weasel less active during extremely cold and hot weather conditions? •	Are there any intersexual and seasonal variations in both activity and time budgets? 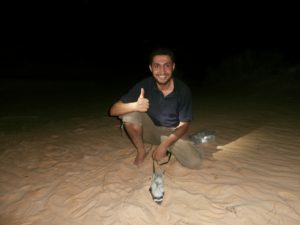 This study will be followed up by dietary analyses (3rd year of PhD) and another radio-tracking/diet study in a natural, desert environment (Jebil Park) with the aim to understand how this species succeeds in living in such extreme conditions (2-year postdoc), hence providing a complete picture of the ecology and behavior of this species in Tunisia. Using results from the ongoing country-wide survey and the planned radio-tracking and diet studies, we will develop a community conservation awareness program to highlight the species’ ecological role. This will involve oral presentations and/or distribution of flyers in several schools throughout the country, discussions with farmers, as well as interventions in radio-programs. We will also contact the Ministry of Agriculture and Hydraulic Resources and national nature protection associations to discuss solutions to current threats. Although rich in herpetofauna diversity, the Indonesian Island of Sulawesi is home to only two endemic chelonians, the Critically Endangered Sulawesi Forest Turtle (Leucocephalon yuwonoi) and the Endangered Forsten’s Tortoise (Indotestudo forstenii; IUCN Red List; CITES Appendix II). As there has been no previous research or conservation efforts focused on these species, their population status is based primarily on anecdotal information. Combined with severe habitat destruction and current and historic collection for the pet and bushmeat trades, these species could soon be facing extinction. Furthermore, neither species is listed as protected within Indonesia, thus adding to the urgency of this initiative. We are conducting population surveys to determine species’ distribution to work toward ensuring their long-term survivability as we will then have a better grasp of the conservation initiatives that need to be employed (i.e. uplisted IUCN status and CITES listings, stricter import/export laws, increased local protection, identification of parcels of land for expansion and/or creation of protected areas). Survey results will initiate long-term monitoring programs, to study daily activities and determine the ecological needs of the species. This program will advance our knowledge of the ex situ requirements leading to an increase in captive breeding efforts. Concurrently, we will develop an in situ captive breeding program, initially focusing on Indotestudo forstenii, with our partner university. This program will provide a platform for education and outreach and allow for the opportunity to track and study a population of released turtles as an on-campus research and training project. During initial population surveys conducted in early 2018, we identified and processed a population of Leucocephalon yuwonoi and Holohil transmitters will be affixed to a subset of these animals. Monitoring will be conducted by students from our partner universities and residents from within study sites who will all be thoroughly trained in field techniques. Radio-tracking will provide valuable information on home-range, habitat preferences, foraging, reproductive and nesting behaviors for a better understanding of the requirements for captive breeding while also assisting in identifying suitable habitat for their future survival in the wild. Combined, data and information will create a better overall assessment of this severely understudied species, their conservation needs, and necessary husbandry requirements for the successful development of much-needed assurance colonies for future reintroduction programs. We are also establishing education and outreach programs to provide local communities with the information and resources they need to become actively engaged in the project. We aim to evoke their sense of personal responsibility toward ensuring the long-term conservation of these species and their habitats and how they can all coexist. 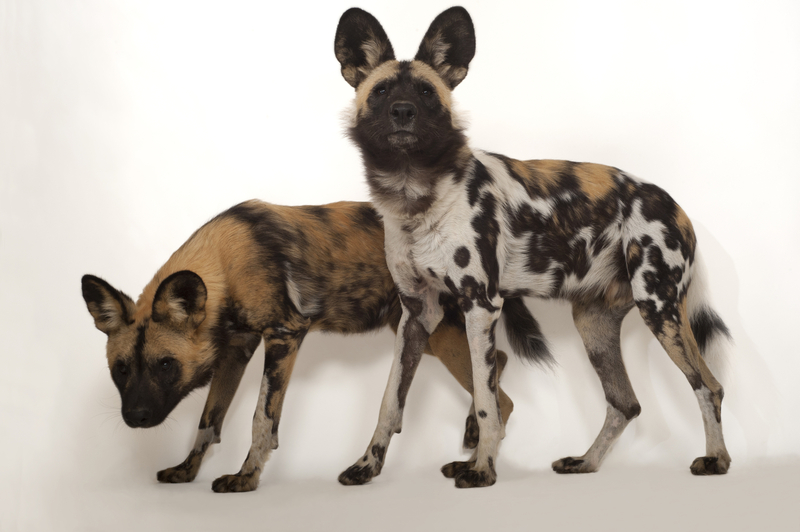 The Greater Kruger National Park (KNP) ecosystem harbors the only viable contiguous population of Endangered wild dogs (~250 individuals in 22 packs), and is extremely important to regional wild dog conservation through its connectivity with Mozambique and southern Zimbabwe. Wild dog packs and dispersal groups frequently use unprotected areas outside the western boundary of the KNP. Here very little is known about individual patterns of survival and reproduction, population-level patterns of dynamics, and home range size and use. Moreover, persecution rate are high and known threats to wild dogs in this area include snaring, disease, road deaths and direct persecution. Further, we are beginning to receive concerning reports from farmers regarding wild dogs on their properties and their desire to remove them. 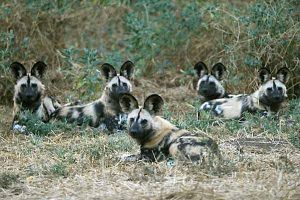 As such, the wild dogs in this area are under immense pressure and only with new data on population dynamics and space use can we hope to protect them, using proactive conflict mitigation strategies. Our project will fit transmitters onto one adult male and one adult female from each of the four packs outside the western boundary of KNP. Once fitted, each pack will be located weekly for the project period of one year to determine population dynamics and home range use, and the factors affecting this. We will also disseminate information obtained (locations, threat awareness) to the community through an existing community education project, farmers days and school presentations. Southern Conservation Trust, a community land trust founded in 1993, preserves greenspace, safeguards rivers, shelters wildlife, provides environmental education, and ensures that everyone has access to nature throughout Georgia. SCT will partner with biologist Dennis Chase (formerly with the U.S. Fish and Wildlife Service) and Dr. Diane Day, Senior Lecturer in Biology at Clayton State University, for a summer program focused on the study of the population demographics of Eastern box turtles (Terrapene carolina carolina) at The Ridge Nature Area in Fayetteville, Georgia. In the last several years, more than 850 turtles have been identified making this research one of the largest box turtle investigative projects in the Georgia. The summer program will offer university students the opportunity to educate the public about the environment and the importance of stewardship. Participants will learn to integrate math, science, reading, computer literacy, and scientific field techniques to understand the long term implications of conservation. Students practice field techniques, radio telemetry and how to determine home ranges and the importance of population monitoring. 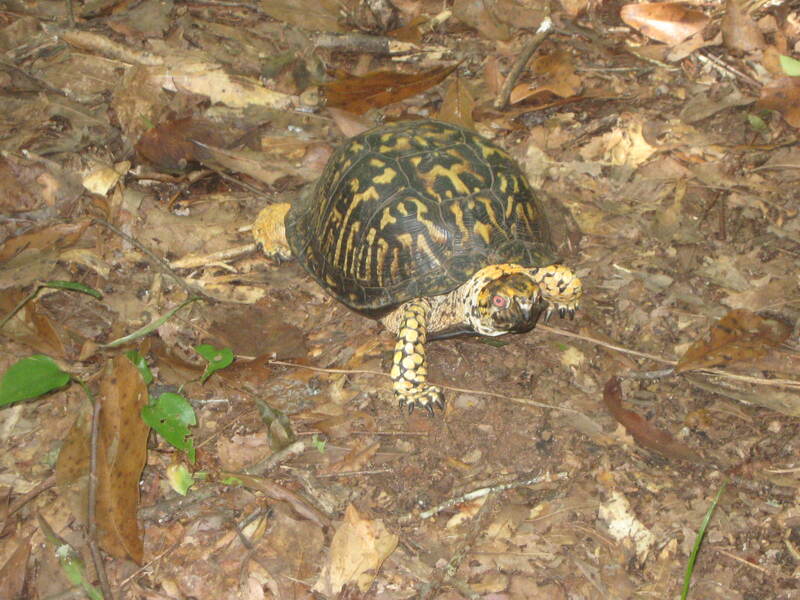 Hands on learning is a key aspect of the summer study, Locating, marking, and tracking the box turtles serves as the foundation from which all of the other activities evolve. Students weigh, measure, and identify the gender of the turtles. They record information about landscape features and identify plants that live in the habitat where the turtles are found. Project leaders and interns will also have the opportunity to introduce their turtle study to the community through the Southern Conservation Trust’s Summer Camp WILD (children ages 6-12, including local Title I schools), and with planned community lectures and demonstrations held throughout the summer/early fall. These lecture/demonstrations will be rooted in project based scientific activities highlighting the importance of conservation and the building and preservation of communities. 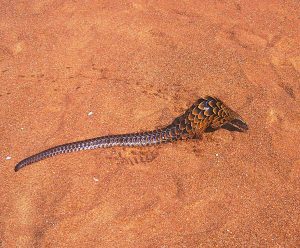 I am pursuing a PhD in Conservation Biology and Wildlife Management at the University of Felix Houphouët-Boigny, Abidjan (Côte d’Ivoire) with the aim of becoming West Africa’s preeminent champion for pangolins! In Cote d’Ivoire, I will study pangolin resource selection and the drivers of local community use of pangolins in and around Tai National Park (the largest forested national park in West Africa) and the Tanoe-Ehy Swamp Forest – Cote d’Ivoire’s only community conservation area. My work is especially focused on the black-bellied pangolin (Phataginus tetradactyla), the least studied pangolin in Africa; however, all three pangolins need research for management action, and so I will inevitably provide important data on white-bellied and giant pangolins as well. 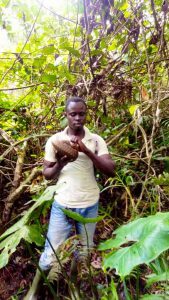 By filling critical knowledge gaps about pangolin ecology and ethnozoology, and building capacity in local pangolin conservationists (I am the first Ivorian to ever study pangolins), my work is laying the foundation for all future pangolin management. Ultimately, I hope that my work will form the basis for a national pangolin management plan and will be a platform for raising awareness about the need to protect pangolins in Cote d’Ivoire and throughout West Africa. The Philippine crocodile (Crocodylus mindorensis), is the rarest crocodile species in the world. It is listed as Critically Endangered in the IUCN Red List of Threatened Species and Appendix I of the Convention on the International Trade of Endangered Species of Wild Flora and Fauna (CITES). 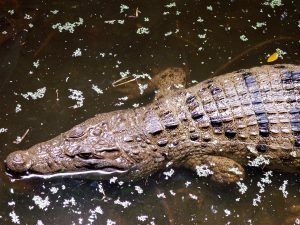 This relatively small and docile Philippine endemic freshwater crocodile was once distributed in major islands of the Philippine Archipelago. Recent wild populations are greatly reduced with remaining wild populations in northern Luzon and some parts of Mindanao having an inferred population 92-137 mature individual. Decline in the natural remaining habitat have pressed the boundaries of unearthing new suitable habitat with protection for restocking programs. In March 2013, we at the Crocodylus Porosus Philippines Inc. (CPPI) have initiated the release of 36 juvenile captive bred Philippine Crocodile in Paghungawan Marsh, Siargao Island Protected Landscapes and Seascapes that marked as another milestone in the history of Philippine Crocodile conservation. Twenty-nine juveniles were also released in July 2017. These initiatives have contributed to the development of community-based ecotourism with high public awareness impact. It also gained more interest in citizen science without any sign of conflict with the communities. 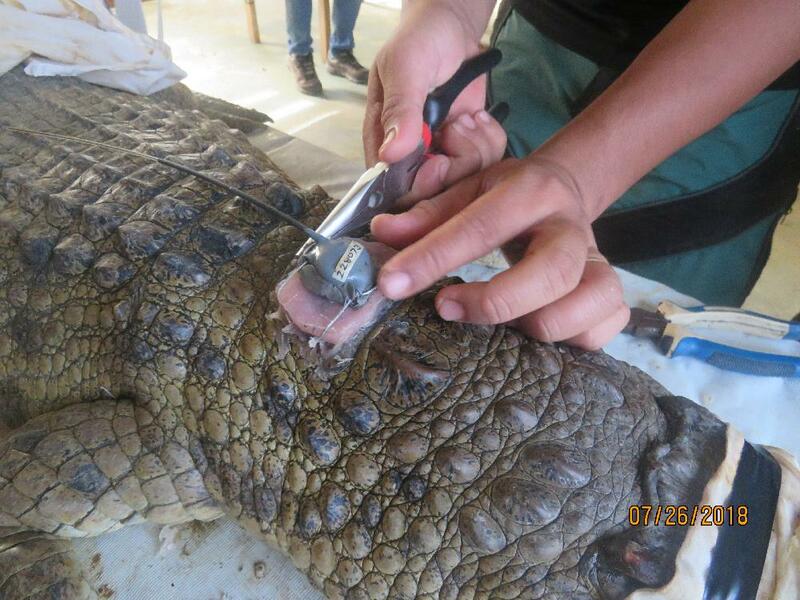 In this coming project, we will use HOLOHIL RI 2B transmitters to determine the home range, daily movements, foraging behavior, and potential territory of the captive bred juvenile Philippine crocodile to be release for conservation introduction. 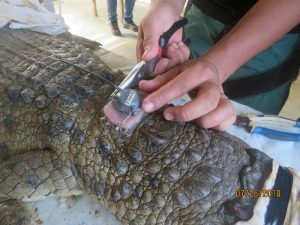 Understanding these variables will enhance citizen science in locating individual crocodiles for community-based sustainable ecotourism. Thereby, increases the sightings probability to be offered for tourist appreciation and effectively deliver species conservation public awareness. This primarily aims to generate knowledge on the crocodile carrying capacity of the marsh and its home range towards more improved model of sustainable community-based eco-tourism as tool in encouraging coexistence. Our data showed interesting behaviors of Philippine Crocodiles in the marsh, including observations of individuals in small and shallow caves situated in steep slopes. Furthermore, as citizen scientists continue to track crocodiles, there was an increase of crocodile sightings during the day which in turn help the community to increase their income from “crocodile watching”, one of the sustainable eco-tourism being offered in the area. We are continuously grateful of your support in crocodile research and conservation. 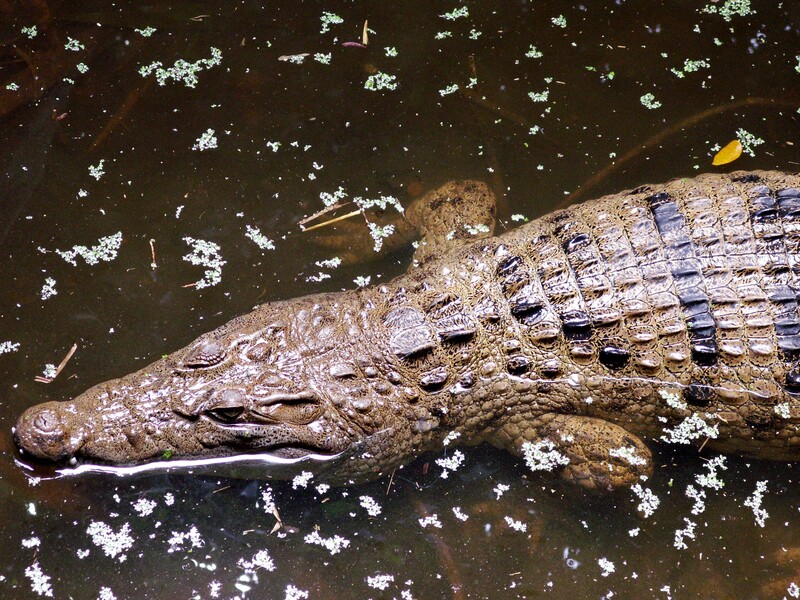 Without it, these unexpected behaviors of Philippine Crocodiles would have not been documented. Habitat loss is a key factor in monarch butterfly (Danaus plexippus) population decline. Monarch habitat restoration efforts are focused on increasing milkweed (Asclepias sp.) for oviposition and larval development and other native prairie plants for adult forage. To implement habitat restoration in locations that are biologically relevant for monarch butterflies, we must first understand how monarchs are currently navigating and utilizing the landscape on a large scale. 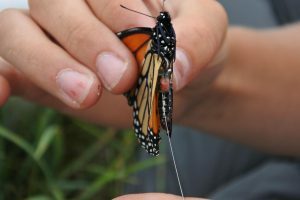 Radio telemetry techniques are being employed with monarch butterflies to track flight patterns, perception distance, and step-length. Initially, hand-held radio telemetry methods were adapted for simultaneous bearing collection and subsequent triangulation to estimate flight paths. Thirteen radio-tagged field-collected monarchs were tracked individually for up to 87 minutes. In 2017, an automated radio telemetry system, adapted from Kays et al. (2011), was implemented to reduce error and increase the frequency of data collection. To test the system and obtain initial monarch behavior insights, radio-tagged monarchs were released known distances from a single ‘patch’ of potted milkweed and nectar plants placed in a 16 ha sod farm. Monarchs took flight steps ranging from one to 1,100 meters, and often avoided the potted resources. Monarchs inhabiting corn/soybean landscapes surrounding the sod field provided an opportunity to empirically assess perceptual range. Monarchs downwind of potted nectar plants exhibited directed flights to these resources from distances of 50 to > 75m. Future telemetry studies will take advantage of more complex habitat scenarios to determine perception distance, as well as flight distances and behavior at habitat edges. 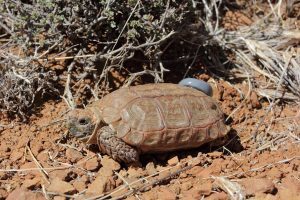 The Karoo dwarf tortoise is a diminutive species restricted to semi-arid, rocky patches in the Karoo, South Africa, and is one of the world’s most underrepresented tortoise study species. 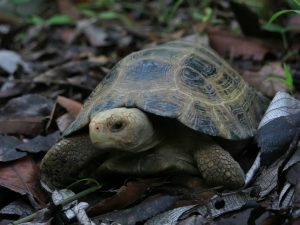 Called the “thunderstorm tortoise”, its activity is limited to scarce rainy conditions within its small distribution range. Recent reports concluded that the species may be in decline, as >800 hours of searching known habitat found just 3 tortoises. However, this apparent scarcity may simply result from a lack of data to understand its diurnal and seasonal activity pattern. For example, we located 8 individuals in a small study area in February 2017. 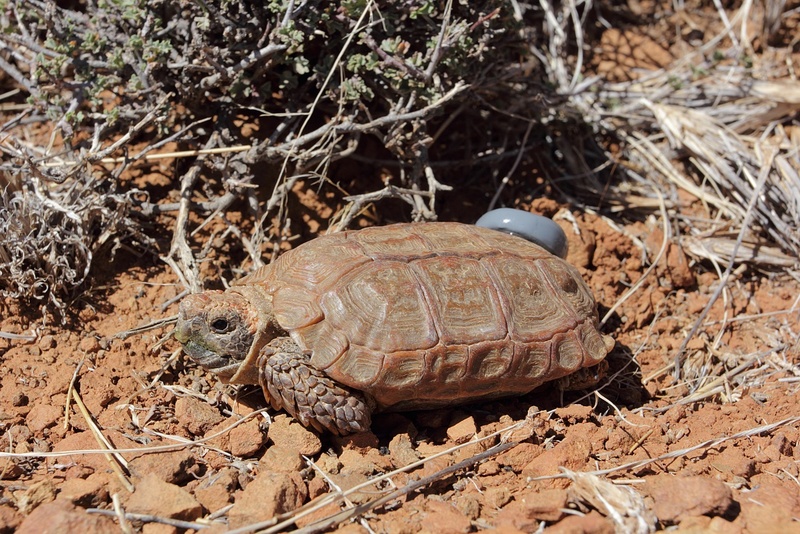 This project will investigate the activity, behaviour and general biology (e.g., home ranges, diet, growth and reproduction) of the Karoo dwarf tortoise using Holohil transmitters for data collection. The data that we will collect will help us accurately assess the status of the taxon and assist managers to conserve it. 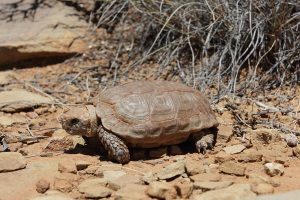 In addition, the results of the study have significant scientific value, as what is known about semi-arid rock-living tortoises is based on the speckled dwarf tortoise (Chersobius signatus) while the Karoo dwarf tortoise inhabits a summer rainfall region, which is quite different. In 2018, efforts will concentrate on finding as many tortoises as possible during the rainfall season and on collecting morphometric, reproductive and dietary data. Ten males and 10 females will be equipped with radio transmitters, be recaptured in 2019, and the larger-bodied females will be recaptured again in 2020. The focus of the 2019 study season is on activity, behaviour and home ranges: telemetered tortoises will be tracked every 1-7 days (depending on activity) to record their coordinates and behaviour. In addition, each one will be tracked early one morning, and subsequently observed throughout one full day, enabling detailed activity budgets to be calculated. All fieldwork will be conducted by volunteers (young zoo keepers, university students and private people interested in conservation), in collaboration with the University of the Western Cape (South Africa). Outreach to local communities will be achieved through interactive presentations about the project at a local level, highlighting the uniqueness of this species and its habitat and the results of the work. 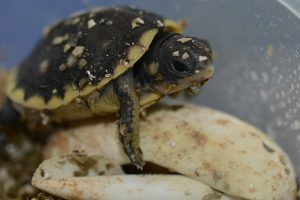 The long-term impact of the study is: (1) Solid data in the public domain regarding Karoo dwarf tortoises in their natural habitat, forming a reliable basis to assess the status of the species; (2) a basis for managers to formulate measures to conserve the species and its habitat, including sympatric species; (3) advanced insight in the effect of climate on tortoise ecology; (4) increased (local) awareness of the conservation of the Karoo dwarf tortoise and tortoises in general. 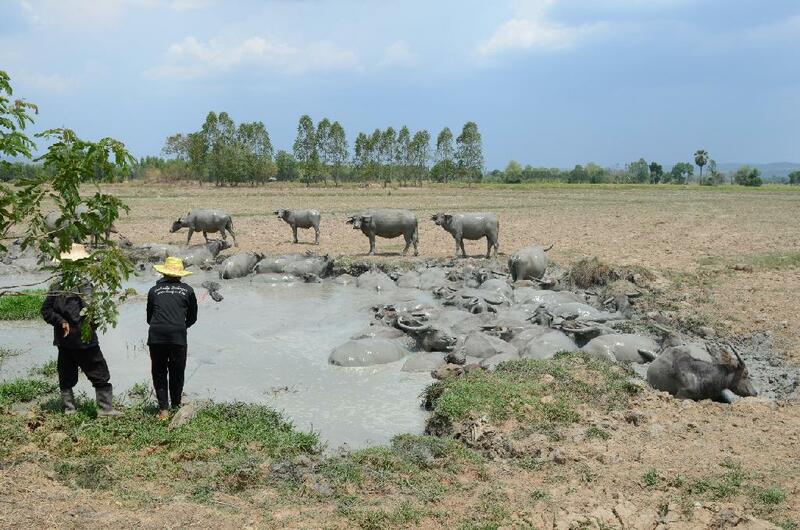 The first sampling was conducted in the 2018 rainfall season, from 14 February until 22 March 2018. 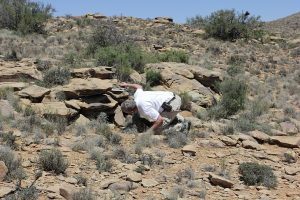 Despite the long-term drought in western South Africa, a single 47-mm rainfall event at the study site provided excellent conditions for plant growth and tortoise activity. 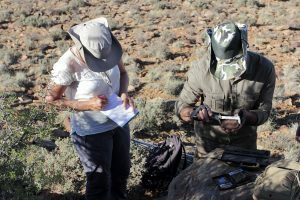 Seven volunteers worked in shifts, for a total of 563 person-hours, to search for C. boulengeri individuals at the study site and its direct surroundings. A total of 50 individuals was found and marked, providing a solid basis for the study of population composition and dynamics, and growth rates. 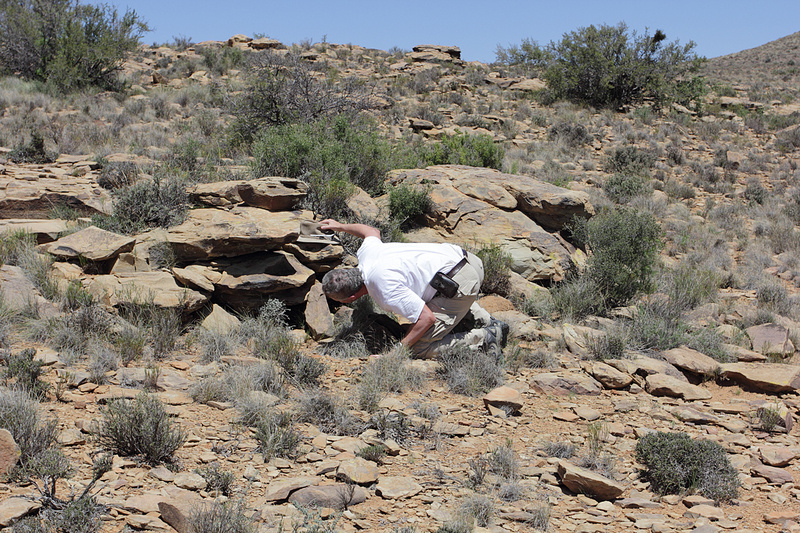 On average, it took 7.6 person-hours and inspection of 150−200 rock crevices to find a single C. boulengeri. We equipped nine males and 16 females with Holohil transmitters. 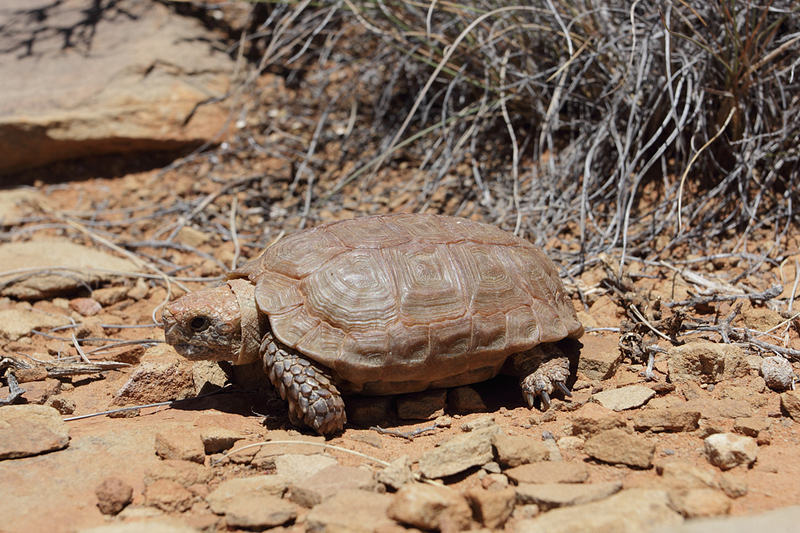 Transmittered tortoises were tracked up to 20 times during the sampling period, to record their location, activity, food items and body temperature. Simultaneously, two students spent a total of 209 hours observing continuous individual behaviours for the calculation of individual time budgets, which was originally planned for the second sampling period in 2019. On 20 February 2018, we radiographed eight females to determine if they were gravid. The growing number of transmittered tortoises enabled us to radiograph 18 females on 8 March. 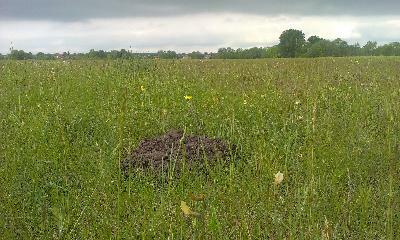 Our preliminary results suggest that the summer behaviour of C. boulengeri is not linked to rainfall. Many individuals were active when there was no rain, but activity was limited to a few hours at the end of the day. It proved virtually impossible to opportunistically locate active C. boulengeri due to their cryptic colouration and behaviour. None of the females was gravid. 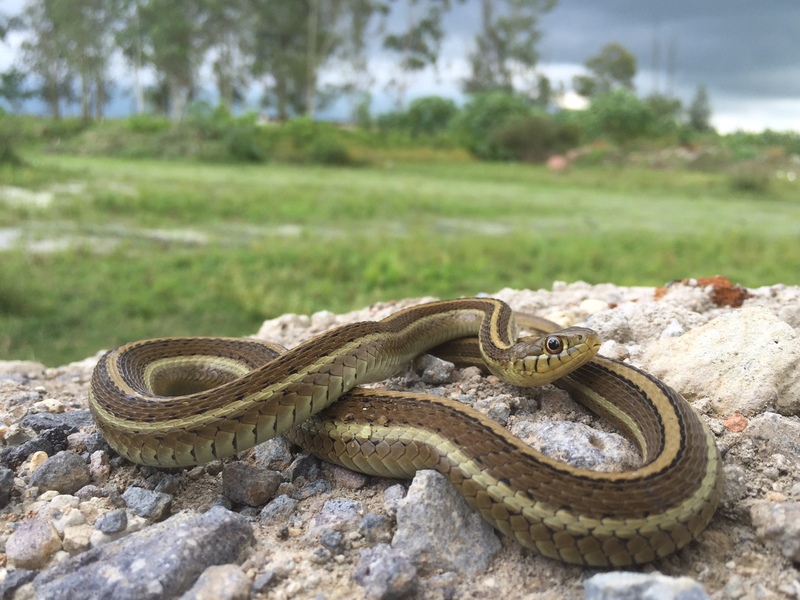 The Rossman’s Gartersnake (Thamnophis rossmani) is one of the most endangered reptiles in Mexico. 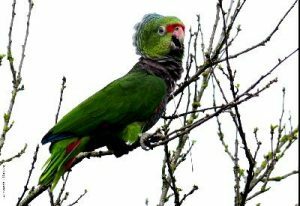 It is a species that has been recorded few times, whose distribution is restricted to an area less than 10 km2 in Matatipac Valley, Tepic, Nayarit, western Mexico. In his description, Roger Conant (2000: 5) mentioned, “available evidence indicates that Thamnophis rossmani may be in grave danger, if not already extinct.” In recent years we have searched for specimens and found more snakes dead (run over) than alive. That is why we will start this work with the objective of knowing its distribution and, thanks to Holohil Systems, we will be able to know the spatial ecology of the species in order to take concrete conservation actions. 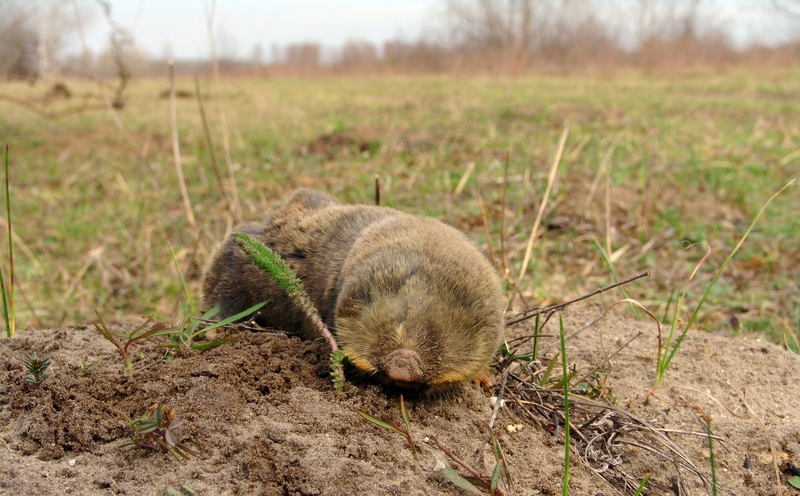 Blind mole rats (Spalacinae) are enigmatic animals due to their special lifestyle: they are completely blind and almost never come up to the surface. 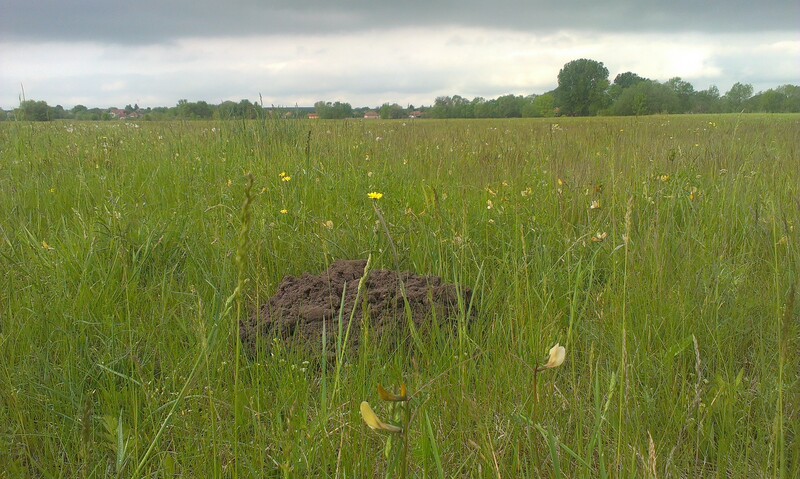 Degradation, transformation of the formerly vast grasslands to intensive monocultures and development areas extirpated these rodents from more than 90% of their original distribution area in the Carpathian Basin. 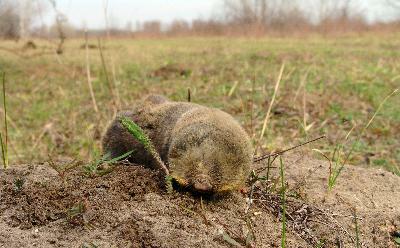 As a result, blind mole rats became endangered and gained the highest-level legal protection in Hungary. Researchers of the Hungarian Natural History Museum (HNHM) started the investigation of their systematics, distribution and conservation biology in 2005. Molecular genetic studies of the Carpathian Basin populations resulted in the elevation of the formerly recognised chromosomal forms of the Lesser blind mole rat species complex Nannospalax (superspecies leucodon) to species rank. They represent the only endemic mammal species of the EU’s Pannonian Biogeographical Region, but they face severe conservation problems. It was revealed that Nannospalax syrmiensis already went extinct and the other three species are assessed as endangered or critically endangered. 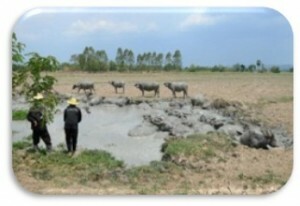 Despite of legal protection, nearly all remaining population fragments are threatened, i.e. because of the building of the Hungarian-Serbian border fence or a solar power plant exactly “over the head” of the blind mole rats. As a pilot study, in close cooperation with the nature protection authorities, two years ago we started the first-ever translocation program of a fossorial rodent. 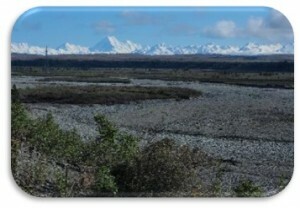 To establish a new population in a state-owned protected area we live-trap specimens and the possibility to equip them with radio telemetry devices would provide an unparalleled possibility to get exact data about their lifecycle, movements, home ranges, etc, – information so far not existing at all, but vitally necessary to effectively protect them. This autumn, we would like to follow five individuals in the newly established population. Outcomes will be the more detailed understanding of the life of blind mole rats, which result in more effective protection of these rare mammals. The Psittacidae family has some of the most threatened species. Two of the main reasons for the rapid and ongoing population decline are habitat destruction and illegal nest poaching. The vinaceous-breasted Amazon (Amazona vinacea) is one of the most endangered amazon species of the Atlantic Forest, a biodiversity hotspot. A. vinacea historically occurred in Brazil from southern Bahia to Rio Grande do Sul, parts of Paraguay and Argentina. It has become rare throughout its extensive range and its minimal population is 3,920 individuals. It is listed on the IUCN Red List (IUCN, 2016) as Endangered with “a very high risk of becoming extinct in the wild in the immediate future”. In Brazil, it is considered Vulnerable. Because of its threat status, research and interventions are urgently necessary to prevent global extinction. In 2010 we developed and implemented a program to effectively reintroduce A. vinacea in the Araucárias National Park, Brazil, where it was locally extinct. Since then, a total of 83 birds victims of illegal wildlife, rescued or captive born, have been rehabilitated, released and monitored as part of our pioneer bird reintroduction effort in a Brazilian National Park approved by the federal governmental agency Chico Mendes Institute for Biodiversity Conservation (ICMBio). Up to date free pairs have been identified, and at least 9 wild born offspring have been observed. In order to improve the chances of success, yearly releases are needed. In 2017, thanks to Holohil, a new group of amazons will be released and monitored in order to help the establishment a viable local population. 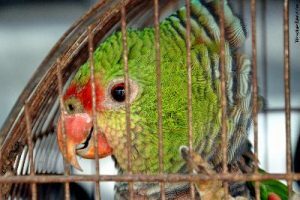 Captive birds welfare will be improved while providing them a chance to play their ecological roles with direct benefit for the conservation of this endangered species and its habitat. Also, Instituto Espaço Silvestre will continue generating scientific knowledge while educating and engaging people in conservation issues and promoting socioeconomic development. In addition to the local impact, this study will contribute to achieving the goals of four Brazilian National Action Plans for the Conservation of Endangered Species and international initiatives as well. We are continuously looking for partners in order to provide needed inputs into the local population. With continuing support from Holohil, it is possible to reverse A. vinacea local extinction and reduce its causes. Amphibians around the globe are in peril of extinction due to the amphibian chytrid fungus (Batrachochytrium dendrobatidis). 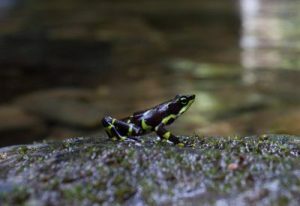 In Panama, many species experienced catastrophic population declines and vanished from known localities as the chytrid fungus passed through the country. 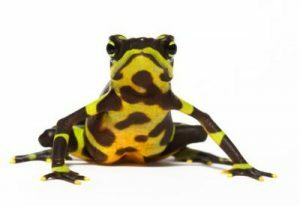 Founding populations of amphibians likely to become extinct were collected for captive breeding, forming the Panama Amphibian Rescue and Conservation Project. Among the most susceptible species of amphibians are frogs belonging to the genus Atelopus. All of which have experienced dramatic populations declines, and one species has not been seen for more than 20 years. We have been successful in breeding and rearing the young of five Atelopus species. This summer we will use radio transmitters from Holohil to track the release of captive bred Limosa Harlequin frogs (Atelopus limosus) from the Panama Amphibian Rescue and Conservation Project. This will the first experimental release of Atelopus limosus. We will use these transmitters to better understand how captive bred frogs cope with being introduced back into the environment, how far they travel and what habitat they will select, natural history and behavior, and see if they can evade chytrid infection. Data gathered from this summer will be important for strategic development of future reintroductions, so we can meet our goal of preventing extinctions of endangered amphibians in Panama. 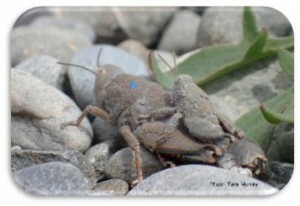 The Robust grasshopper (Brachaspis robustus), is a nationally threatened grasshopper endemic to the high plateau area known as the Mackenzie Basin in the South Island of New Zealand. They are better described as a ‘gravel-hoppers’ given they only occur in stony braided river habitats. Introduced mammalian predators (hedgehogs, cats, mustelids) and habitat modification appear to be driving population decline but little is really understood about the grasshopper life history characteristics, ecological requirements, population dynamics or recovery techniques. 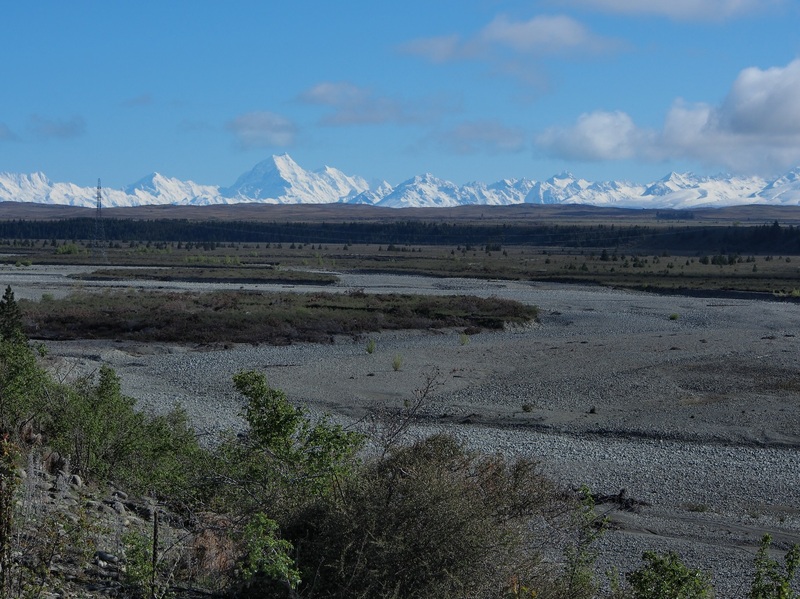 In 2015 Dr Tara Murray from the University of Canterbury, New Zealand, began a collaborative project with the Department of Conservation and Environment Canterbury to facilitate science driven conservation management for the grasshopper. 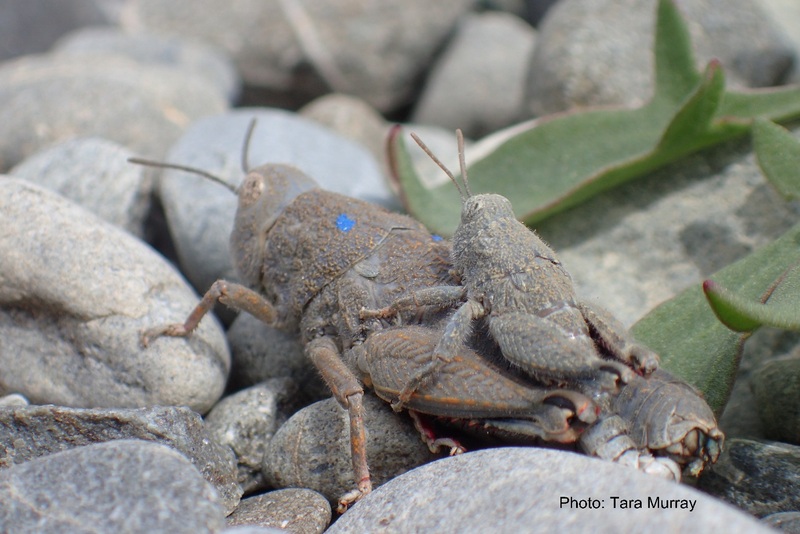 186 grasshoppers were translocated into a predator reduced area and monitored for over a year. 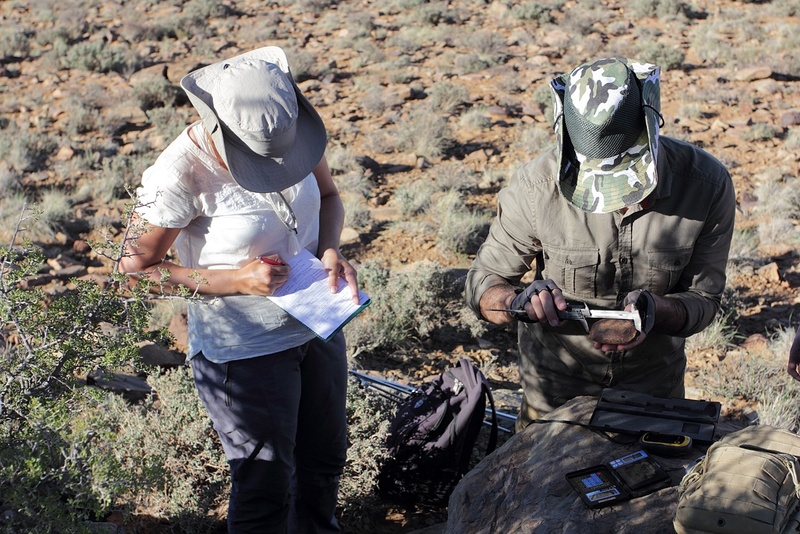 At the same time mark-recapture and transect monitoring methods have been trailed at wild sites to try and determine how to accurately monitor population trends of this extremely cryptic species. In 2017 we will use HOLOHIL LB-2X transmitters to track the movements of 10 adult female hoppers during the day and night. Only females will be tracked as males are significantly smaller. Tracking will be conducted to determine daily movements, foraging behaviour, and to locate night refuges and oviposition sites. This will assist us in understanding the ecological requirements of the grasshoppers, their exposure to different predators and habitat requirements needed to facilitate successful in-situ management or translocation. Locating oviposition sites will allow us to ascertain crucial life history traits. We hope some of the lessons learned from this project will be transferrable to other threatened grasshoppers and encourage more insect conservation programs. 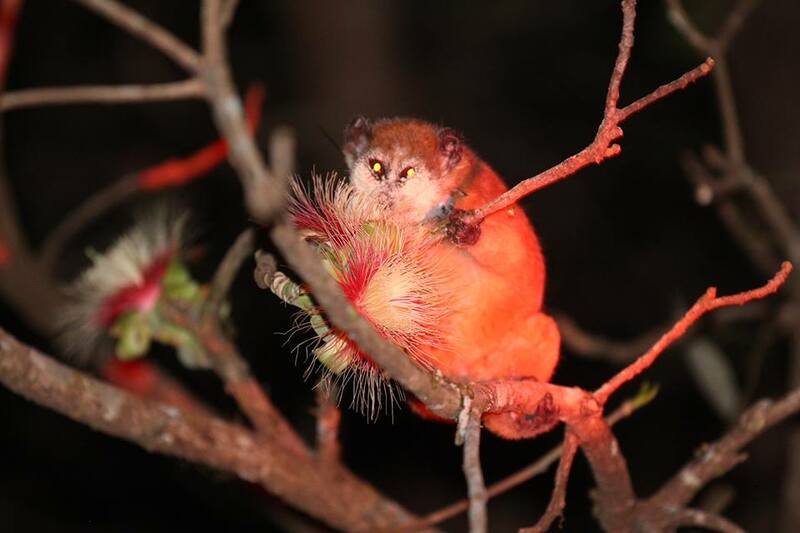 The Dao Tien Endangered Primate Species Centre, working within Cat Tien National Park South Vietnam has rescued and rehabilitated the small nocturnal pygmy loris (Nycticebus pygmaeus) from the illegal wildlife trade in Vietnam for eight years. During this time over 40 individuals have been radio-collared and returned to the wild. Post- release monitoring data has helped move forward this field of reintroduction biology with protocols developed for successful release and survival of individuals. 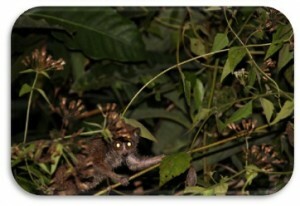 However increasingly individuals are being caught in the buffer zone surrounding the National Park, with densities suggested of wild loris higher outside of protected areas than within. These populations are crucial with a landscape conservation view if we are going to save this endangered primate from extinction. When we receive individuals from plantations they are often in poor condition, with fire damage from plantation management and skin problems, but they are present with high frequencies of sightings. 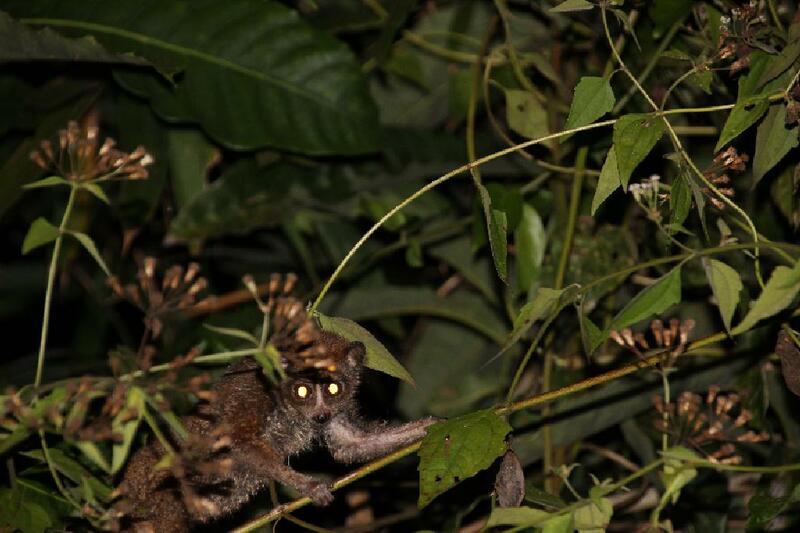 In this project we will work with local farmers and find out why they the pygmy loris go into the plantations, how much time they spend in the plantations and what do they do? Do they raid crops, damaging fruit like the squirrel or instead function as bio-engineers, helping pollination and pest control, munching away on the insects that normally harm the crops. Working together with the farmers to track the pygmy loris in this mixed plantation area we hope together to find the answer to these questions. 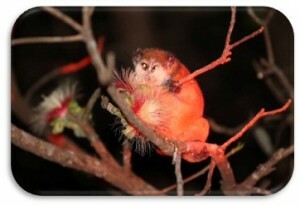 This will provide a valuable key to evolving a proud culture of living alongside pygmy loris, protecting them as valuable attributes to the ecosystem instead of pests. Over the next months we will survey the buffer zone assessing the different habitats. As part of Sakaerat Conservation and Snake Education Team (SCSET) I am performing my master’s degree research at Suranaree University of Technology as an advisee of Dr. Colin Strine. 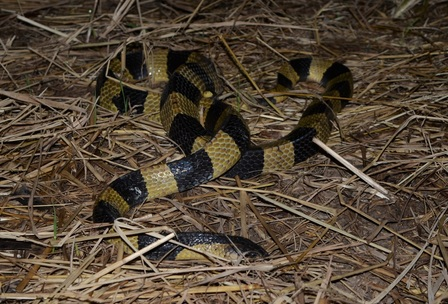 I am using radio telemetry to assess the spatial ecology, habitat use, and activity periods of banded kraits in the human dominated agricultural areas of the Transitional Zone in Sakaerat Biosphere Reserve. 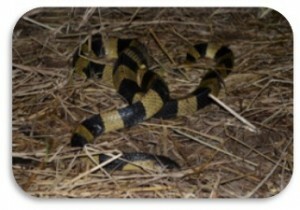 We have radio tracked 4 kraits during the last year as preliminary research for my master’s degree. Kraits are highly venomous snakes belonging to the infamous family Elapidae, shared by other well-known snakes such as cobras, mambas, and taipans. 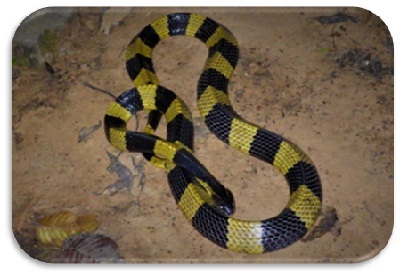 Two krait species can be found within the Sakaerat Biosphere Reserve, the Banded Krait (Bungarus fasciatus) and the Malayan Krait (Bungarus candidus). 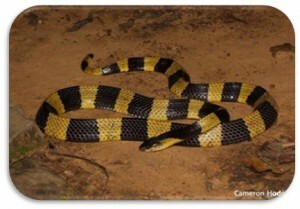 Kraits live throughout southeast Asia and are responsible for human mortalities resulting from snake bites in largely rural areas. However, I suspect the majority of snake bites often occur when people attempt to move, kill or otherwise initiate contact with snakes. My research attempts to identify areas with potential for conflict between kraits and the human inhabitants of the vastly agricultural portions of the Biosphere Reserve’s human-dominated outskirts. As the project progresses we intend to employ drift fence traps along agricultural canal systems to increase telemetered sample sizes of both species. Surveys and camera traps will also be used to determine habitat occupancy and the level of human activity within krait home ranges. With a better understanding of how kraits live near humans, coupled with dissemination through community outreach, we can reduce the number of snake bites. By reducing snake bites, improved perceptions may soon fallow. I would like to thank Holohil for assisting our research and conservation goals here in Thailand.